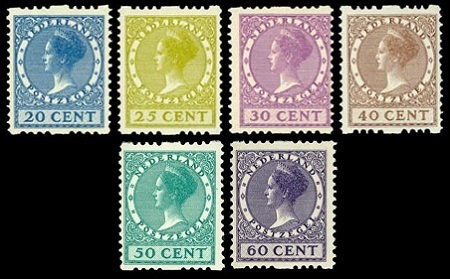 By 1924, the definitive Netherlands stamps with the investiture portrait of eighteen year old Queen Wilhelmina, that first issued in 1899, had run their course, and it was time for them to be replaced. 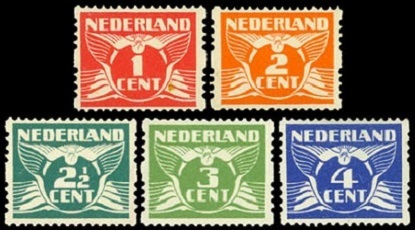 The three definitive-postage-type Netherlands stamps shown above were issued on September 6, 1924 for the International Philatelic Exhibition at The Hague. These stamps are photogravure, perforated 12 1/2, and they are printed on unwatermarked paper. These very attractive new designs had a more modernistic look to them, and they featured a more mature, left-facing portrait of Queen Wilhelmina. These new designs would evolve into the standard higher-denomination definitive postage stamps of the Netherlands for the next sixteen years. These three stamps were only available to visitors at the International Philatelic Exhibition of 1924, and they were never placed on sale at post offices in the Netherlands. As a result, they are very scarce today. 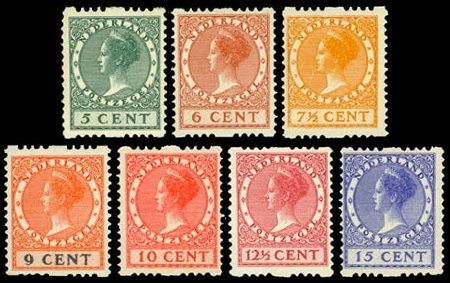 The nineteen new sheet-format definitive Netherlands stamps shown above were issued between 1924 and 1926. They are all perforated 12 and unwatermarked. 01 C. (1924 - NVPH #144, Sc. #142) - Carmine. 02 C. (1924 - NVPH #145, Sc. #143) - Red Orange. 02 1/2 C. (1924 - NVPH #146, Sc. #144) - Green. 03 C. (1925 - NVPH #147, Sc. #145) - Light Green. 04 C. (1924 - NVPH #148, Sc. #146) - Blue. 05 C. (1924 - NVPH #149, Sc. #147) - Green. 06 C. (1925 - NVPH #150, Sc. #148) - Red Brown. 07 1/2 C. (1925 - NVPH #151, Sc. #149) - Yellow. 09 C. (1926 - NVPH #152, Sc. #150) - Red Orange and Black. 10 C. (1924 - NVPH #153, Sc. #151) - Light Red. 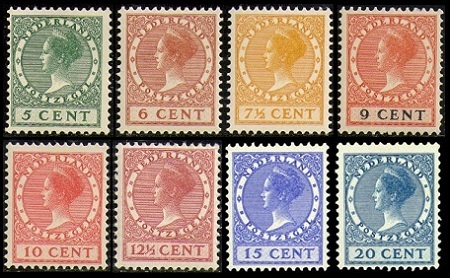 12 1/2 C. (1924 - NVPH #154, Sc. #152) - Lilac Rose. 15 C. (1924 - NVPH #155, Sc. #153) - Ultramarine. 20 C. (1925 - NVPH #156, Sc. #154) - Dark Blue. 25 C. (1924 - NVPH #157, Sc. #155) - Olive Green. 30 C. (1924 - NVPH #158, Sc. #156) - Dark Lilac. 35 C. (1925 - NVPH #159, Sc. #157) - Olive Brown. 40 C. (1924 - NVPH #160, Sc. #158) - Brown. 50 C. (1924 - NVPH #161, Sc. #159) - Blue Green. 60 C. (1925 - NVPH #162, Sc. #160) - Violet. 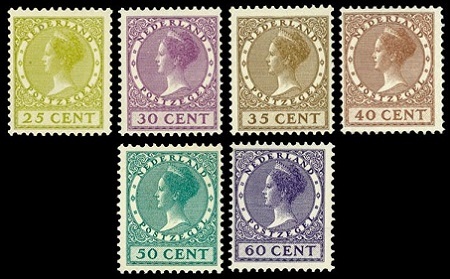 During 1925 and 1926, eighteen of the nineteen unwatermarked, sheet-format, Netherlands stamps were also issued in coils, featuring syncopated perforation Type A. They are all shown above. For an explanation of syncopated perforations and illustrations of the four types, please refer to the lower part of the Netherlands category page. 01 C. (1925 - NVPH #R1, Sc. #142a) - Carmine. 02 C. (1925 - NVPH #R2, Sc. #143a) - Red Orange. 02 1/2 C. (1925 - NVPH #R3, Sc. #144a) - Green. 03 C. (1925 - NVPH #R4, Sc. #145a) - Light Green. 04 C. (1925 - NVPH #R5, Sc. #146a) - Blue. 05 C. (1925 - NVPH #R6, Sc. #147a) - Green. 06 C. (1925 - NVPH #R7, Sc. #148a) - Red Brown. 07 1/2 C. (1925 - NVPH #R8, Sc. #149a) - Yellow. 09 C. (1926 - NVPH #R9, Sc. #150a) - Red Orange and Black. 10 C. (1925 - NVPH #R10, Sc. #151a) - Light Red. 12 1/2 C. (1925 - NVPH #R11, Sc. #152a) - Lilac Rose. 15 C. (1925 - NVPH #R12, Sc. #153a) - Ultramarine. 20 C. (1925 - NVPH #R13, Sc. #154a) - Dark Blue. 25 C. (1925 - NVPH #R14, Sc. #155a) - Olive Green. 30 C. (1925 - NVPH #R15, Sc. #156a) - Dark Lilac. 40 C. (1925 - NVPH #R16, Sc. #158a) - Brown. 50 C. (1925 - NVPH #R17, Sc. #159a) - Blue Green. 60 C. (1925 - NVPH #R18, Sc. #160a) - Violet. 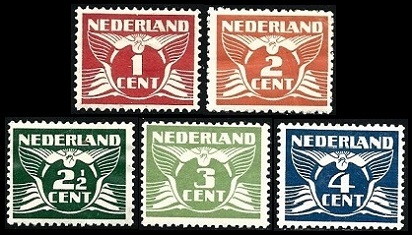 The three new Gulden denomination definitive Netherlands stamps shown above were issued between 1926 and 1927. They are unwatermarked. 01 G. (1926 - Perf. 11 1/2 - NVPH #163A, Sc. #161) - Blue. 01 G. (1930 - Perf. 12 1/2 - NVPH #163B, Sc. #161a) - Blue. 02 1/2 G. (1927 - Perf. 11 1/2 - NVPH #164A, Sc. #162) - Red. 02 1/2 G. (1930 - Perf. 12 1/2 - NVPH #164B, Sc. #162a) - Red. 05 G. (1926 - Perf. 11 1/2 - NVPH #165A, Sc. #163) - Dark Gray. 05 G. (1930 - Perf. 12 1/2 - NVPH #165B, Sc. #164a) - Dark Gray.